The most desired card of 2018 and likely the most talked about Superfractor since the legendary Stephen Strasburg Superfractor was auctioned in 2010, has been sold. Despite the untimely set of circumstances, this card still commanded serious numbers at auction and there's a good chance a lot of the marquee value was due to international interest. The auction lasted well over a week and closed on Thursday, 9/20/2018 with 27 bids at $184,056 (includes buyers premium). 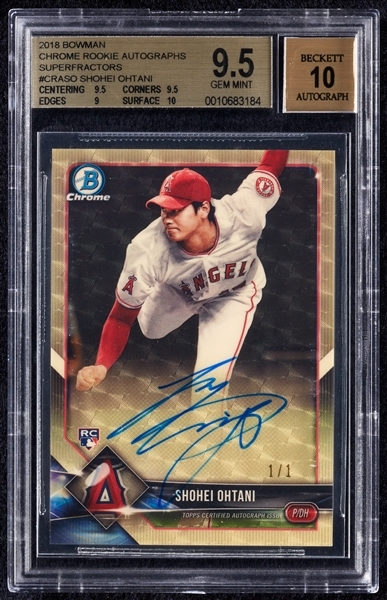 If Ohtani is likely to have TJ surgery concluding the 2018 season, he'll be out for the entire 2019 season, which would be an excellent time to buy his cards. That said, the hype around the Superfractor will subside considerably but won't ever be forgotten and there's always the possibility we'll see it again down the line.